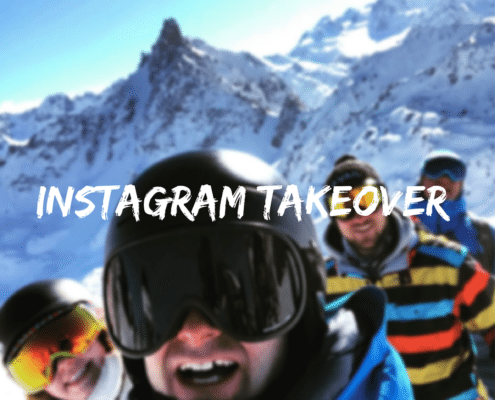 Last summer, we had an enquiry for some sit ski lessons in Verbier. We had a qualified instructor available, but with no equipment and no previous bookings of this kind before, we knew we were in for a challenge. Instructor Eva Wichtowski, Swiss Manager Tom Waddington, and myself (Gabby here! ), were all keen to try and make adaptive skiing in Verbier happen. With a lot of effort from all sides, support from our New Gen teams, Disability Snowsport UK (DSUK), and last minute help from Summit Ski School in Zermatt, we achieved our goal. We were able to borrow the equipment necessary in order to offer our clients the lessons they need. 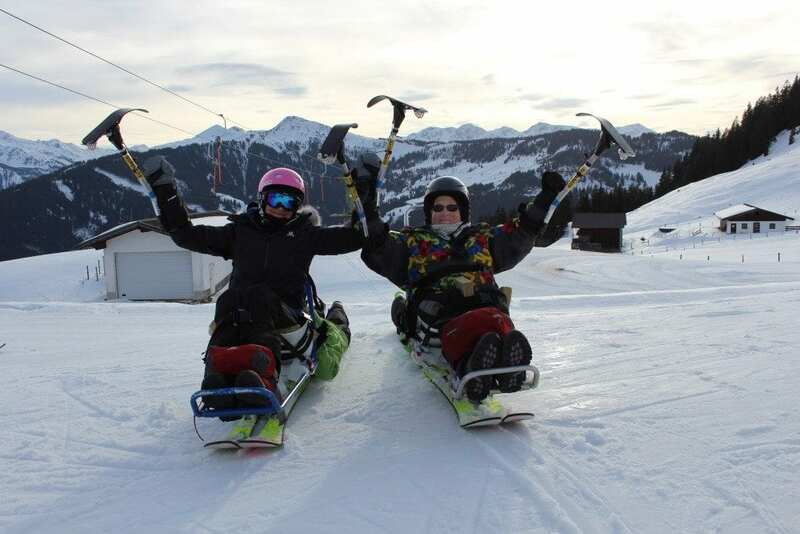 Our success further increased our motivation develop our Adaptive Program in Verbier. With a view to enable clients with sensory, cognitive and physical disabilities to enjoy the thrill of the mountains. 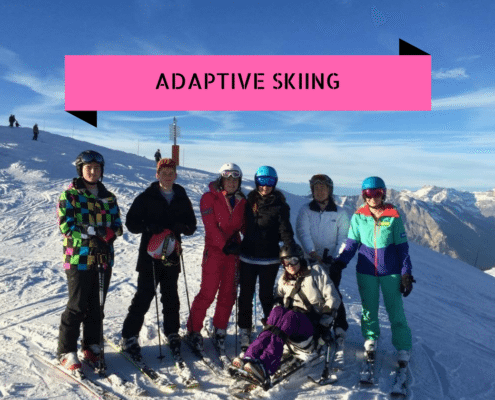 When taking an adaptive lesson, instructors quite literally need to adapt to make the skier comfortable and as able as their disability allows them, thereby achieving the greatest level of independence. Both Tom and I are very excited about this program and the opportunity to make skiing accessible for everyone. 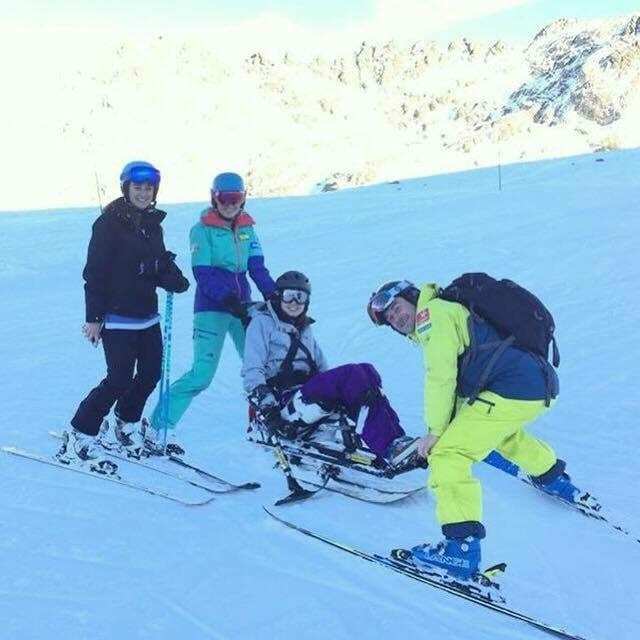 From this winter we would like to be able to offer all types of Adaptive Skiing in Verbier. But to do this we will need some equipment. We have teamed up with DSUK for help with this, and have begun fundraising this week. We hope to raise enough for a Mountain Man sit ski. To increase our potential for donations, Tom and I are signed up to run the Lausanne Marathon on 30th October, 2016. As this is just over 8 weeks away, we have been training for some months already. 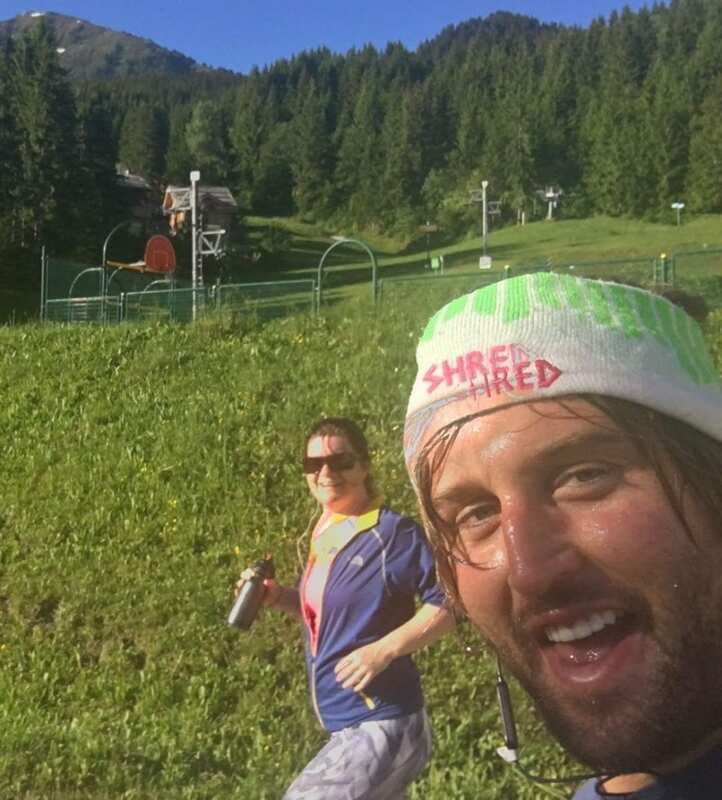 We haven’t done much training together, as I am in Courchevel, and Tom is in Verbier. He was over here for a few days in June so we did some running and talked about training plans, types of shoes, runner-geek gadgets, etc. We also took a dip in the lake in Bozel after one training session, where unfortunately Tom was attacked by duck fleas. He’s not been keen to come back and run with me since! Tom is not really a running kind of guy. He’s a big fella, 6ft-ish of rugby player proportions. His usual fitness work focuses on strength and cross training to keep his muscles in shape for his BASI/Instructor Trainer work through autumn and winter. Long distance running is a new level of strange for him, but he’s doing well so far. I have run a few half marathons before, and I trained for a marathon last year, but had to pull out 6 weeks before due to injury. For me, it’s also partly a personal hurdle that I must get over. So far, so good on the training front, and I’m facing a 15-miler at the weekend which I feel OK about. I do actually love running, especially as I am spoilt on the scenery front here in the French Alps. 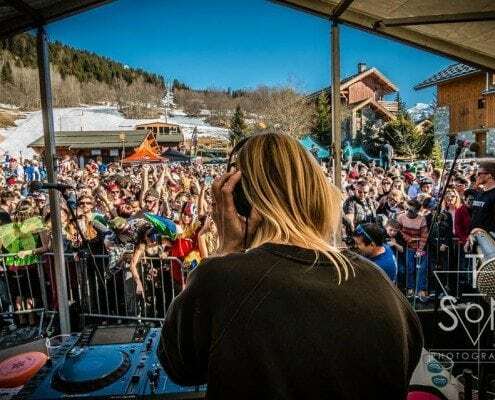 We really want to be able to offer adaptive lessons in Verbier without having to jump through hoops every time, and getting the equipment is our priority. Keen to help us along this journey? Then we’re sure to make it. It’s only 42 kilometres. All we have to do is get to the finish line, right?